Semester Aboard, the first book in the YA urban fantasy series More than Magic series has a brand new cover! 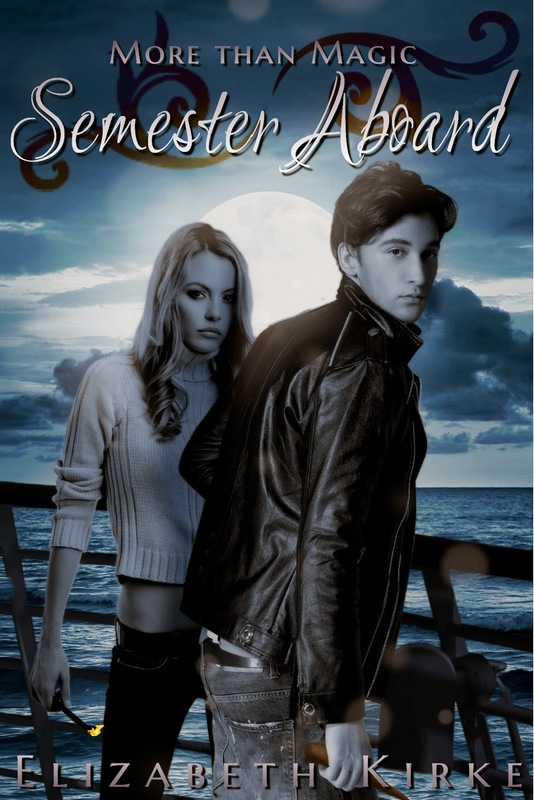 If you haven’t read Semester Aboard yet, here’s a quick summary and a little peek for you! But Jen’s childhood fantasy come true is about to turn into a nightmare; there’s something on the ship. Something dangerous. Suddenly, everyone on board is threatened by a creature that Jen never even believed existed. Jen and her new friends might be the only people who can stop it! Now Jen has to learn everything she can about her new world before it kills her. And her friends. And maybe everyone on the entire ship! 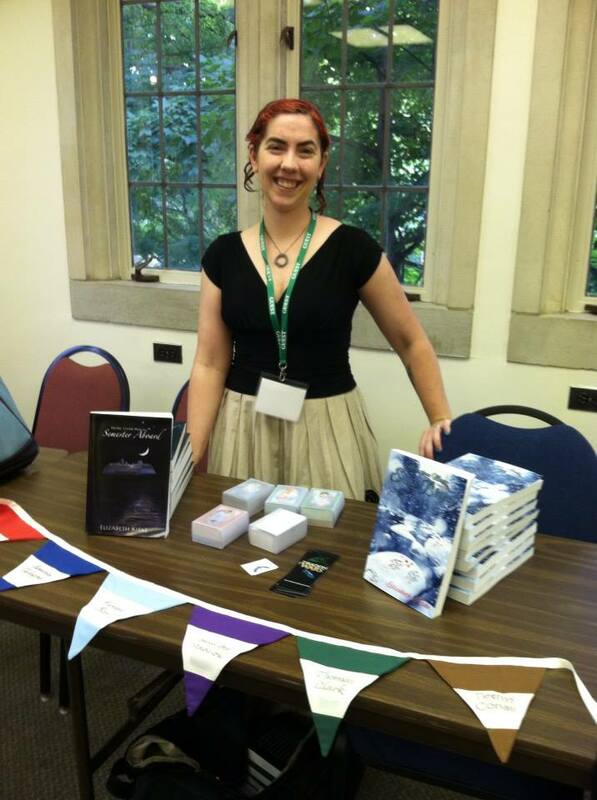 The More than Magic series is written by Elizabeth Kirke. It started raining early in the afternoon and was a bad storm by the time I went to bed. I woke up in the middle of the night and stumbled over to our bathroom, feeling awful. A bit of quality time bent over the toilet didn’t help at all and I decided to try for some fresh air. I pulled a sweater on over my pajamas, hung my ID card strap around my neck, and slipped out of the room. I made my way down the corridor to the door that led outside. For the first time since getting on the ship I had to keep one hand on the railing. The halls were well lit, even though it was the middle of the night, and it was almost disconcerting to step outside into the darkness. But the moment the cool, damp wind hit my face I felt better. I hadn’t been seasick since our first night, but sometimes I felt nauseous if I stayed in our room too long. Being out on the deck always helped. I had assumed that I’d be the only one crazy enough to go out in the rain in the middle of the night, but to my surprise I wasn’t. There were people on the other side of the deck. It was too dark to see them well, but the lights from the deck above us illuminated them a little. One of them was Charlie. He was standing under the overhang where Deck Five extended out above Deck Four. He was just wearing a t-shirt and jeans and I shivered in sympathy. A guy I recognized, not surprising since we all lived on a ship, was sitting on the bottom steps of the outdoor stairway that led to Deck Five. He was probably a football player back home or something. He had shaggy, dark brown hair and a fairly large nose. I’d heard a few girls giggling about him, but I didn’t think he was that good looking. I wasn’t sure what his name was. Another guy was sitting in a chair, probably pilfered from Deck Five, with his back to me and his feet up on the rails. Mariana was near him, wearing only a bikini top and a short skirt. I couldn’t believe she wasn’t cold. “I didn’t scream!” she said. “You totally did! You freaked out!” Dani laughed. It had been too dark to notice Dani until he spoke. My jaw dropped in shock. Dani was sitting on the railing of the ship. Messing around on the rails was one of the first things they’d told us not to do when we got on board. Even sitting on them in the middle of a calm day was suicidal at best. But to sit there in the middle of a stormy night was nothing short of a death wish. “I was not!” Mariana cried. As Mariana spoke she spun to face Dani and shoved him hard. Dani’s laugh turned into a yell of surprise and he tumbled backward off of the railing! I gasped in horror. Every second now was critical. If someone went overboard we were supposed to immediately throw them a life preserver and then run and tell a crew member. But not a single one of them did anything! The one in the chair uncrossed his legs and recrossed them with a different one on top. The guy on the stairs threw back his head and laughed! Charlie quickly stuck his head over the railing and then pulled back and shivered. It was as if Dani hadn’t gone overboard at all. “Oh my god!” I gasped. They must have been in shock. That was the only reason they weren’t rushing to save Dani. I ran across the deck, at the very least, I could throw the life preserver in and hope he was still alive to use it. They all jerked around to look at me. They acted more surprised to see me than they were about Dani falling overboard. Mariana gasped and backed against the rail. Charlie stepped to the edge of the overhang and Football Guy jumped off of the stairs to his feet. The guy in the chair was on his feet in an instant. I hardly even saw him move; one second he was sitting and the next he was up. He stepped in front of the others, almost protectively. They were acting like nothing had happened! This was insane! And now, what you came for, the new cover! In addition to the new cover, courtesy of the amazing Strong Image Editing, a bonus chapter, from a different POV as been added to Semester Aboard, along with a glossary! It has also been edited one more time, just for good measure! It’s available from Amazon and Smashwords! Good Day Folks, This is a must read. You will love the story. 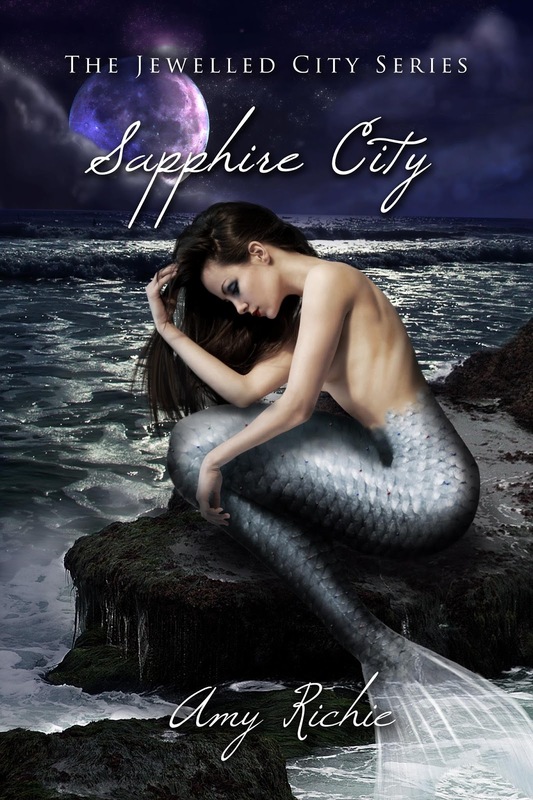 Welcome to the Sapphire City Blog tour! Presented by Phenomenal Reviews and hosted by some fabulous blogs! Strange things happen on Nortica; people disappear and voices call from the ocean. For Stella Shaw, things are about to get even more weird. Welcome to Nortica. Population: ten.After her latest run-in with the police, Stella’s mom takes her back to her childhood home, the island Nortica. But they find it much different than the stories Mom told. Most of the people have disappeared and the ones left are really weird. What people are saying about Sapphire City! Amy Richie was born in a small northern Ohio town where she grew up and lives there still with her three children. She comes from a large family with an even larger extended family. In 2012, Amy joined up with Anchor Group Publishing and now has two series started. The Immortal Love Series and The Blood Vine Series, a new YA. 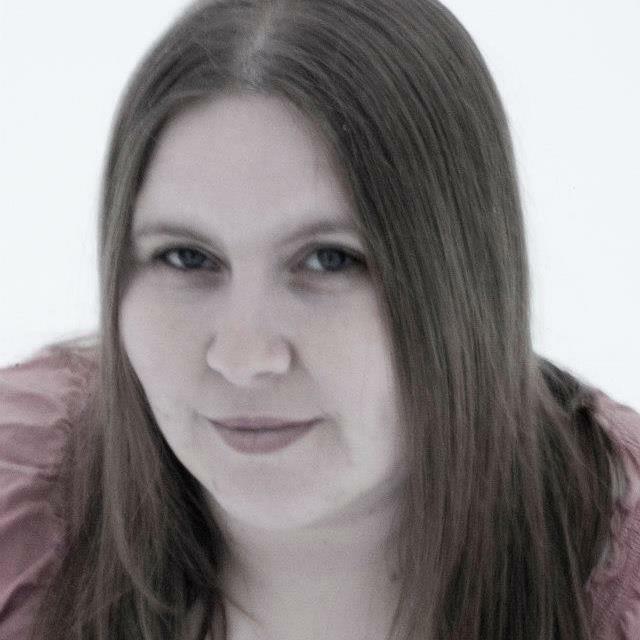 Amy writes things that are not of this world; either paranormal or fantasy. Vampires, werewolves, mermaids, time travel, ghosts, and even garden gnomes. 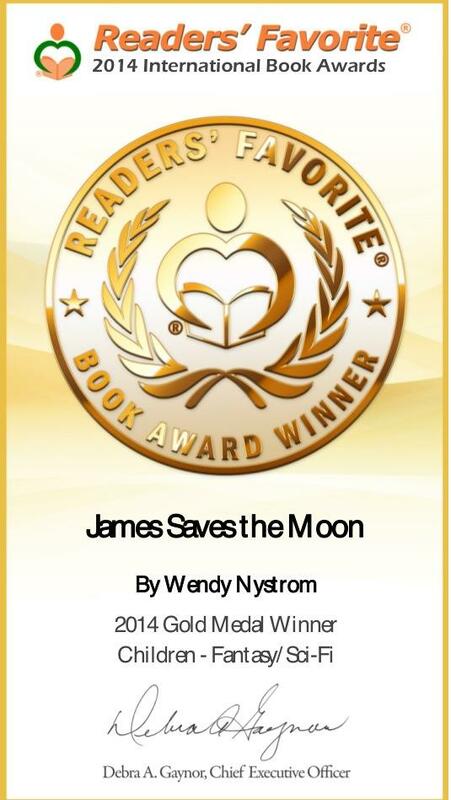 To find out more about Amy Richie or her books visit her at amyrichie.weebly.com .